Although many sources state that Elvis 'had no acting experience' he was actually quite interested in acting during his youth and his fellow students at the Humes High School reminisce that he frequently played one of the main roles in Shakespearian plays that were enacted in their English classes and had an admiration for Brando and James Dean, whose performing styles suited his own approach to the art. His first screen test was for Paramount on 26th March 1956, almost immediately after the release of his first music album, and involved a scene from 'The Girls of Summer' by William Inger. He also did a screen test for a part in 'The Rainmaker' which starred Burt Lancaster but, despite stating in a radio interview that he was to appear in the film, the part of Jim Curry was given to Earl Holliman. He signed a seven-year contract with Paramount producer Hal Wallis on 25th April and was considered for a part in 'The Rat Race' that eventually starred Tony Curtis and also as a replacement 'partner' for Jerry Lewis after the break-up of Lewis' partnership with Dean Martin. Elvis was eventually 'loaned' to Twentieth Century Fox and made his screen debut in 'Love Me Tender' (originally titled 'The Reno Brothers') in November. Originally Elvis was only to perform the title song, but several more were added during the making of the film, capitalising on his musical successes, which Elvis was not entirely happy with but his fans loved. Despite a number of negative reviews the film, and Elvis' acting, was generally well received and it did quite well at the box office. The inclusion of songs in the format of the film was to set the tone for the many that followed, as was the commercial decision to issue LP and EP versions of the songs to support the release of the film. The first few films required comparatively dramatic performances from Elvis but the mid-sixties output became almost purely contrived vehicles to carry the songs. 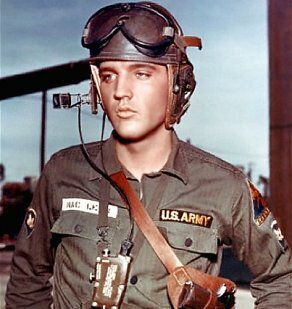 Sixties film roles that Elvis (or Colonel Tom Parker) turned down included 'Your Cheatin' Heart', 'Sweet Bird Of Youth' and 'The Fastest Guitar Alive'. "I get tired of playing a guy who gets into a fight, then starts singing to the guy he's just beat up"
"When you do ten songs in a movie they can't all be good. Anyway, I got tired of singing to turtles..."
"I wasn't exactly a James Bond in this movie. But then, no one ever asked Sean Connery to sing a song while dodging bullets"